Have a question? It's probably answered here! If it's not, we're always here to help at 800-770-4376 (HERO) or Solutions@HEROPM.com. 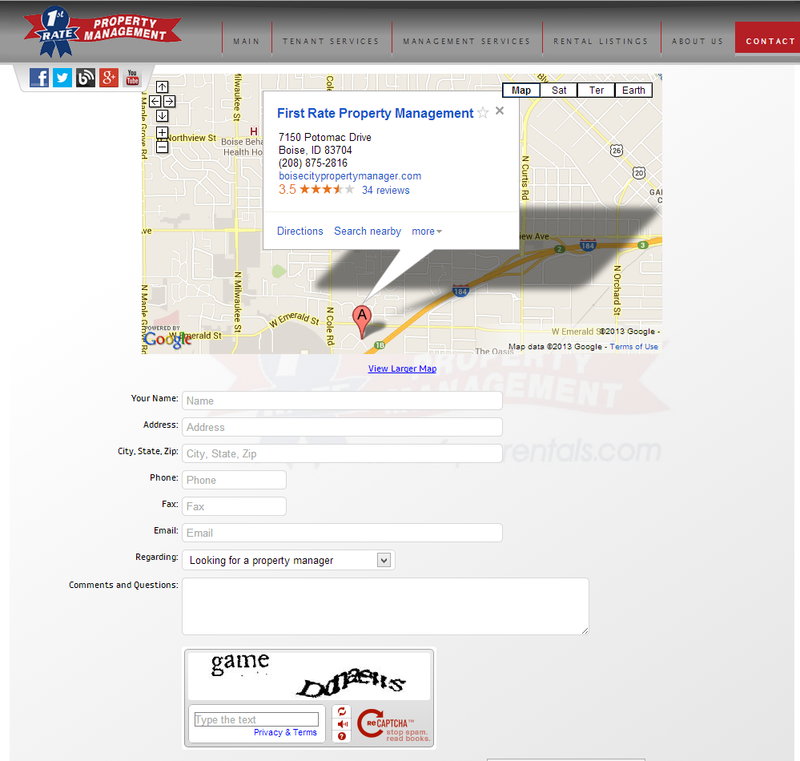 What does "Built for Property Management" mean? What does "Easy to Manage" mean? What does "Legendary Support" mean? Why should I get a HERO Website? Why not WordPress, Drupal, or Joomla? Why not hire the designer down the street? What is real-time SEO analysis? What about dynamic images like slideshows and sliders and showcases? What about separate websites for my sales, association, maintenance company, etc.? What about sales and commercial listings? What about portals, applications, rent payments, work requests, etc.? What about downloadable forms and files? What if I want to get "under the hood"? As we launched our business many years ago, HERO PM came to a startling realization: property management is unique! Property managers have unique challenges, a unique audience, unique requirements, and a unique approach. In working with tens of thousands of property managers, we have created solutions directly targeted toward property management. We did not start with a generic solution and try to fit property managers into it. Instead, we started with a blank slate, and built property management specific solutions from the ground up. This becomes apparent whenever you use HERO PM systems. You won't find yourself scratching your head and wondering where this button is, or why this function works this way. Instead, you'll find that everything looks, works, and functions in exactly the way you'd expect. 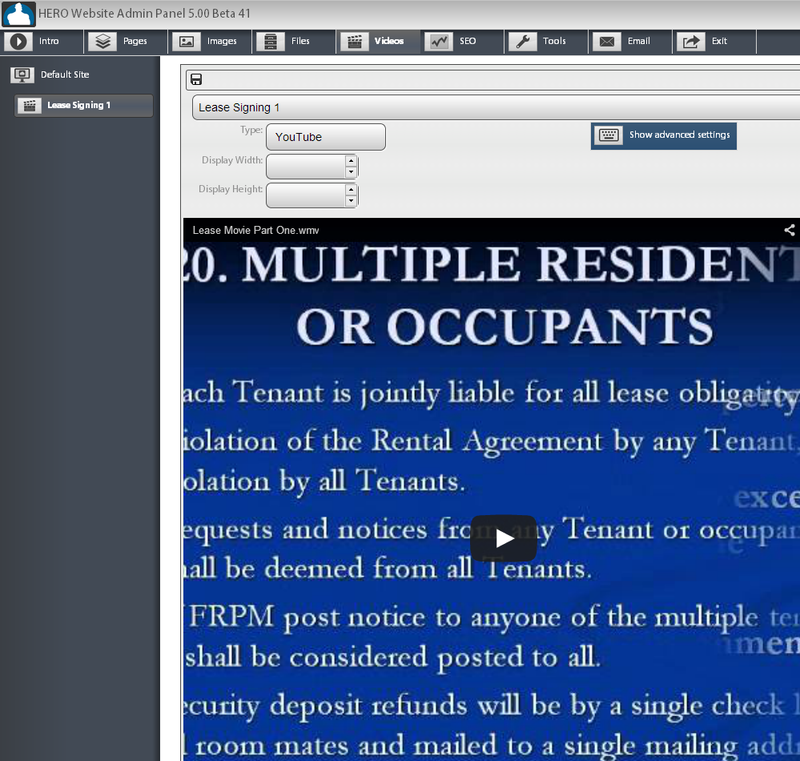 Everything, from the foundation on up, is designed for property managers. Don't settle for being a square peg jammed into a round hole; choose a solution that was built for you. SEO is Search Engine Optimization; it's the art and science that makes your website appear in search engine results when someone is looking for what you offer. In building thousands of property management websites, HERO PM has built a system that focuses on what a property manager's audience is looking for, and making sure that your site is found in the top search results. Websites v5 starts with the structure that Google is looking for. 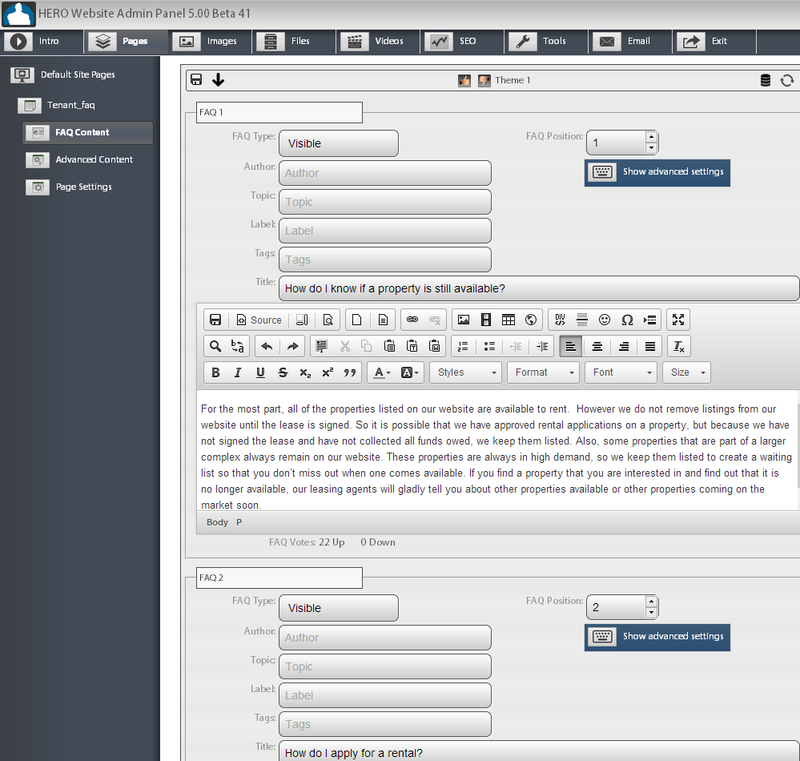 Behind the scenes, Websites v5 automatically generates the structure, links, and formatting that Google desires. While some other systems try to do this, they can't come close to the SEO performance of Websites v5, in large part because they're not systems built for property management. Websites v5 includes real-time SEO analysis. This tool dynamically compares your website to what Google wants, and to the top search terms being entered into Google by rental property owners and tenants. Other solutions can guess, but with the data that comes from managing more property management websites than any other company, HERO PM knows. Websites v5 also includes listings and video SEO. Instead of the "SEO juice" of your listing and video content being attributed to the system provider, as the others do, HERO Websites v5 uses a unique dynamic-to-static HTML generator to make sure your website gets the advantage of search engine keywords in your listing and video content. The proof is in the pudding. So far, every v5 website we've created has risen to top 3 position in Google within weeks, and stayed. HTML5 is the new language of the Internet. 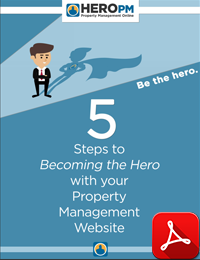 When developing Websites v5, HERO PM decided that it was time for property managers to have the opportunity to make the leap into the next-generation web. Other systems have a combination of hacks, patches, and adjustments that make them work with HTML5, but Websites v5 is built on HTML5 from its foundation. It's clean, it's slick, and it's a performer. Read more about HTML5 in What is HTML5? Websites v5 takes a very practical approach. We assume that you want to be able to manage your own website content, simply and without taking a class at your local community college. We also assume that some users may want to get under the hood and really turn a wrench. We also assume that sometimes you don't want to be bothered with your website administration at all. Websites v5's multi-tiered administration gives all property managers the best of all worlds with an easy-to-manage website. We're not like WordPress, which is a blogging platform that can be shaped into a website. We're not like Adobe Business Catalyst which is a design and publishing platform targeted to website professionals. Nor are we like Drupal, which is a complex web development platform for developers. 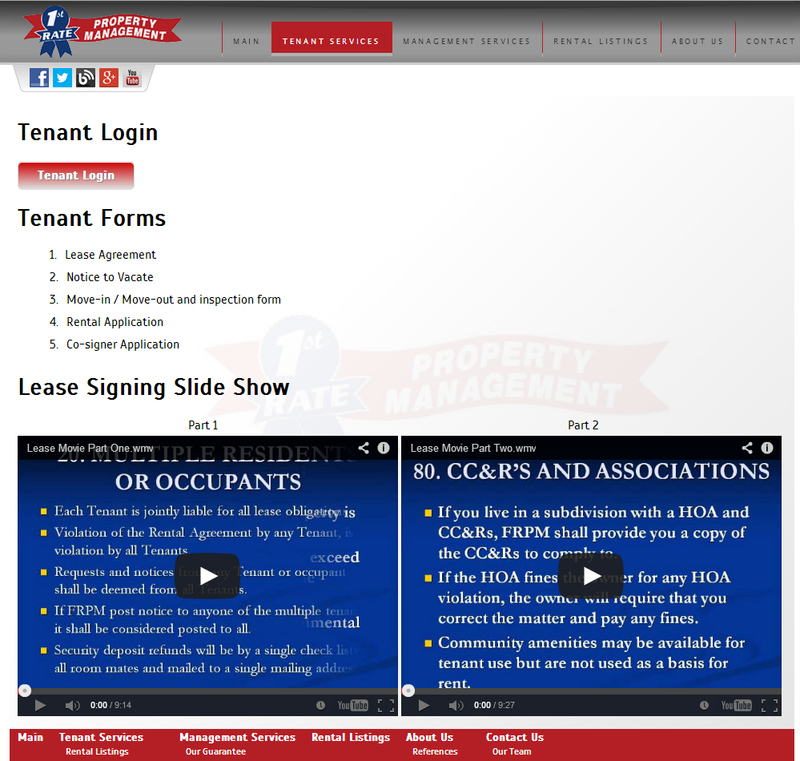 We are HERO Websites v5, which is a website platform for property management. It's the only platform that does exactly what property managers need, because it's the only platform built from the ground up for property managers like you. We are available to help and we speak your language. We understand property management. We understand your needs, your timelines, your constraints, and your regulations. Many of the staff on our support team have over a decade of personal experience in real estate and technology. With every HERO PM package, support is free and unlimited, by phone or email. We are here for you, and will continue to be. If you've been doing property management long, you've had a technology provider who has gone out of business or sold out leaving you holding the bag. You've been frustrated learning a system or product only to have it pulled out from under you. In this industry, many companies are built to sell - they start their business with the idea that once they get enough customers, they'll sell their product or company, usually to a larger company for whom residential property management is a sideline at best. Don't trust your technology future to the next Atlantis. When you have a technology need, you need a company who can be found, and who responds to your unique needs and expectations, with understanding and effectiveness. You need a presence online, where owners and tenants are looking. You need to be found when owners and tenants search for you. You need to have your listings show up wherever tenants search. You need to be attractive to prospective clients. You need to deliver important information in an absorbable format. You need to be free to change things on your website as desired. You need someone available for support and advice. HERO Websites is the solution to all of these needs, and more. 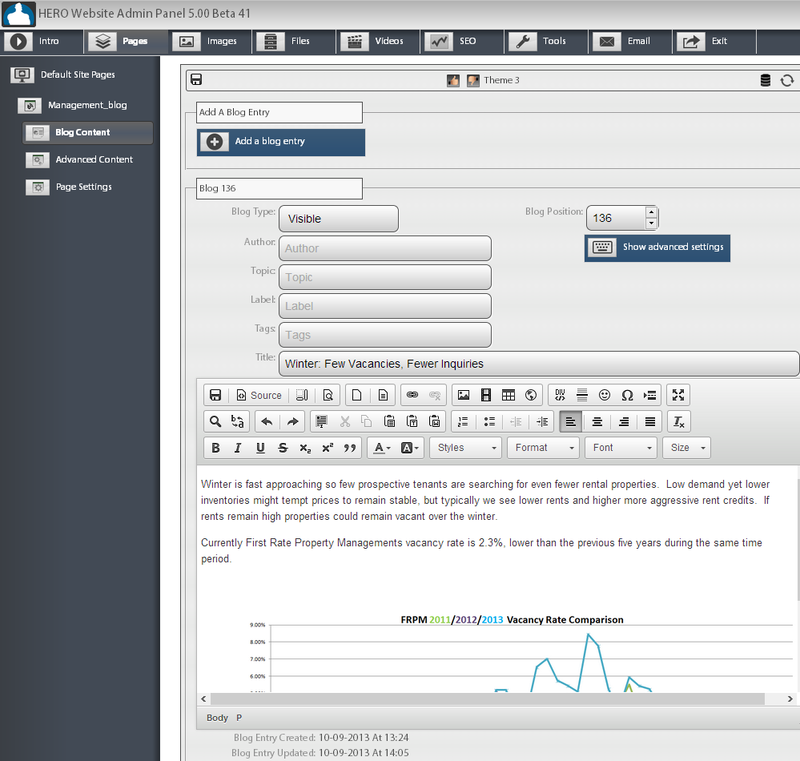 There's nothing wrong with these one-size-fits-all content management systems. In fact, many great websites are built on these platforms. The only problem with one-size-fits-all is that it usually doesn't. Quickbooks is a one-size-fits-all accounting system, and property managers often find it just doesn't fit them. Since 1997, we've been watching property managers pull their hair out when they're jammed into a solution that just doesn't fit, and it hurts their business. 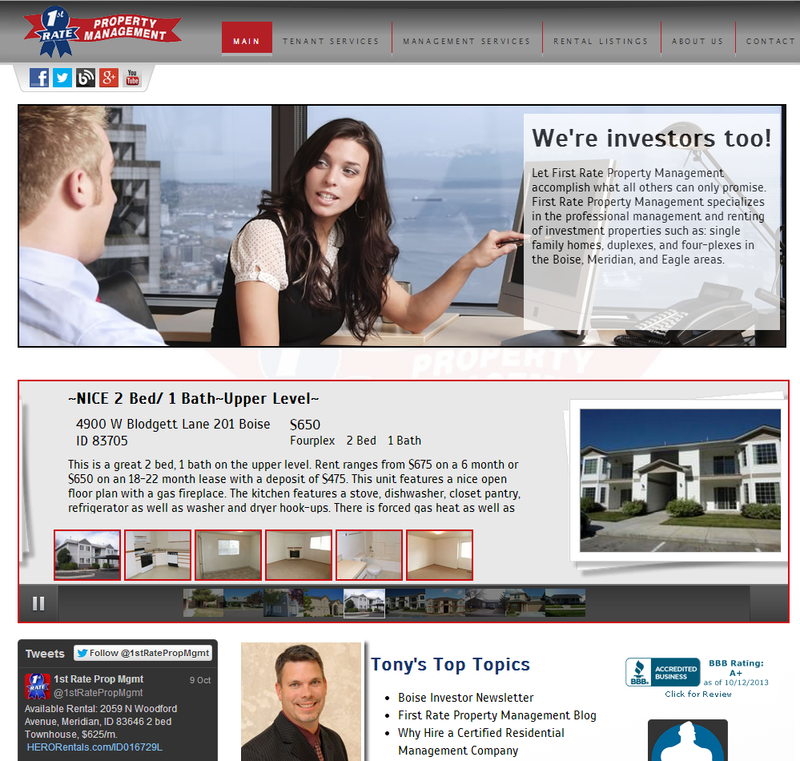 HERO Websites is built from the ground up specifically for residential property managers. We're not a good solution for 24-hour diners or for haberdasheries - we fit property managers, and we fit like a glove. You certainly can! HERO Websites works well with any designer. After working with hundreds of designers on thousands of sites, we have learned one thing: it's rare to find a designer that understands property management. Property management is unlike most industries; a property manager has to create a design and content that satisfies two disparate audiences (owners and tenants) who desperately need each other but do not want each other. Other industries that deal with two audiences, like real estate buyers and sellers, do not understand the complexity of the manager-owner-tenant relationship. That's a heavy burden for any designer to tackle, and we've seen that most fail. HTML5 is the new language of the Internet. It is the successor to HTML4, which was released in 1997 and has been powering most websites ever since. However, HTML4 had limitations, and the Internet could not go where envisioned without a new language. HTML5 was started in 2008, and was finalized in 2014. While HTML4 will be around for a while, the adoption rate of HTML5 is pretty astounding. Already, most Fortune 500 websites are running HTML5, and all standard browsers have majority support for HTML5. The benefit of HTML5 to designers, content managers, users, and search engines is tremendous. If you're not on HTML5 now, you need to be. Now that HTML5 is the standard, HTML4 websites are the clunkers of the web, and users and search engines will know it. HERO Websites v5 is built entirely in HTML5 and provides full HTML5 benefits to website owners and users. Real-time SEO analysis is the only way to ensure that your site is meeting the criteria necessary for high search engine placement. Everything else is just guesswork. High-priced SEO firms often have tools like this, and they charge you a premium each time they analyze your site. With HERO Websites, this tool is built right into your website, and doesn't cost you a dime. WebGadgets are an advanced form of widgets, those little streams of code that cause your site to do something fantastic. HERO Websites comes with dozens of built-in webgadgets, everything from a listings ticker to social media feeds. Best of all, you can create your own webgadgets at any time, or we can create them for you. Do you need your site to confirm what it is the fox says? A webgadget can do that. Do you need a clock that counts down to rent day? A webgadget can do that. Or how about a dynamic badge displaying your average rent? A webgadget can do that. Of course, all of the webgadgets mentioned above are entirely useless, but we hope you get the point! Basic blogging is built right into your website. There are two things that make HERO Websites' built-in blogging better than Blogger or WordPress, and one thing that makes it worse. No matter which blog platform you use, it can still be embedded into your HERO Website. It does not have the negative SEO performance hit that comes with dedicated blogging engines. Blog posts are seen more like pages in your website, so they are more likely to increase your Google ranking than posts from a dedicated blogging platform. It's built right into your website and does not require separate setup or management. Simply create a page in your website, select Blog as the page type, and start blogging! Dedicated blogging platforms have some features that we've decided not to offer. We don't have things like author profiles or reader comments. But we do offer a ton of other things, from the (almost) entirely useless emoticon gallery to blog search to RSS feeds. The bottom line? If you are an impassioned blogger who blogs while you sit at a red light and while waiting for the coffee to brew, chose WordPress or Blogger as your platform and embed it into your HERO Website (we can help you do this). If you are a property manager who wants to blog occasionally as a way to inform your clients, establish yourself as an industry expert, and increase your search engine position, the HERO Websites built-in blogging is the right solution for you. Again, built right in. 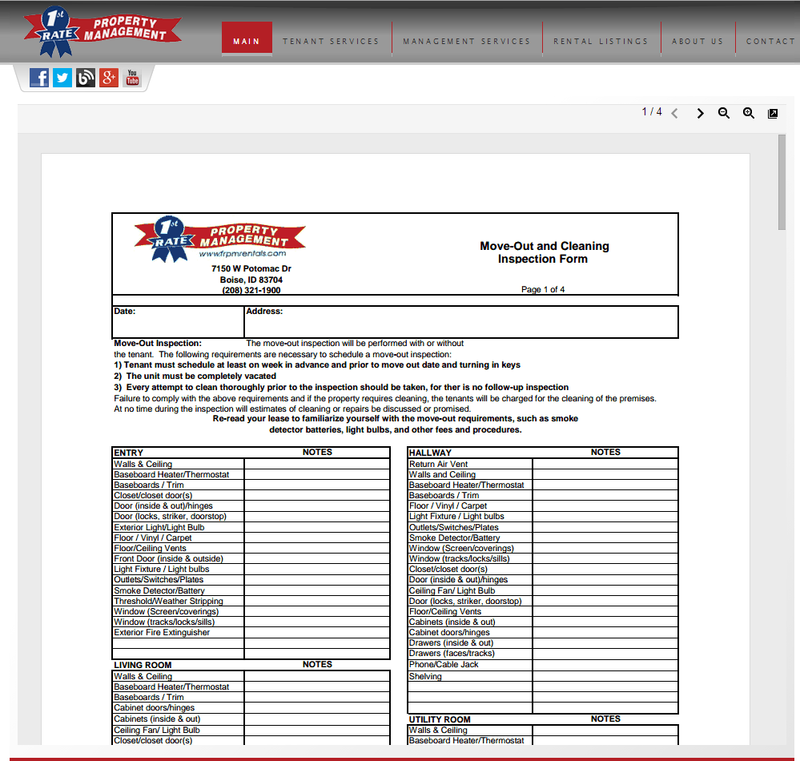 With the HERO Websites form tool, you can create a form page and fully customize your forms and surveys to your heart's content. Do you need a client prospect request for proposal form? Point, click, and done. The same goes for a post move-out tenant survey, or an owner satisfaction survey. With HERO Websites, results of submitted forms and surveys are submitted to your desired email account and stored in a datafile so that you can pull the results into a spreadsheet or database tool for analysis and tracking. HERO Websites has slideshow/slider/showcase functionality built right into the core of the program, for both images/content of your choosing, and available listings. To create a custom slideshow/slider/showcase for your site, just add a page and select Image Slider as the page type. Then add your images and text, and you're all done. Any time you want to add or change an image, just point and click. There is no easier system. To include a slideshow of your available listings, just select the include option and choose the Listings Slider. The system does the rest for you automatically. 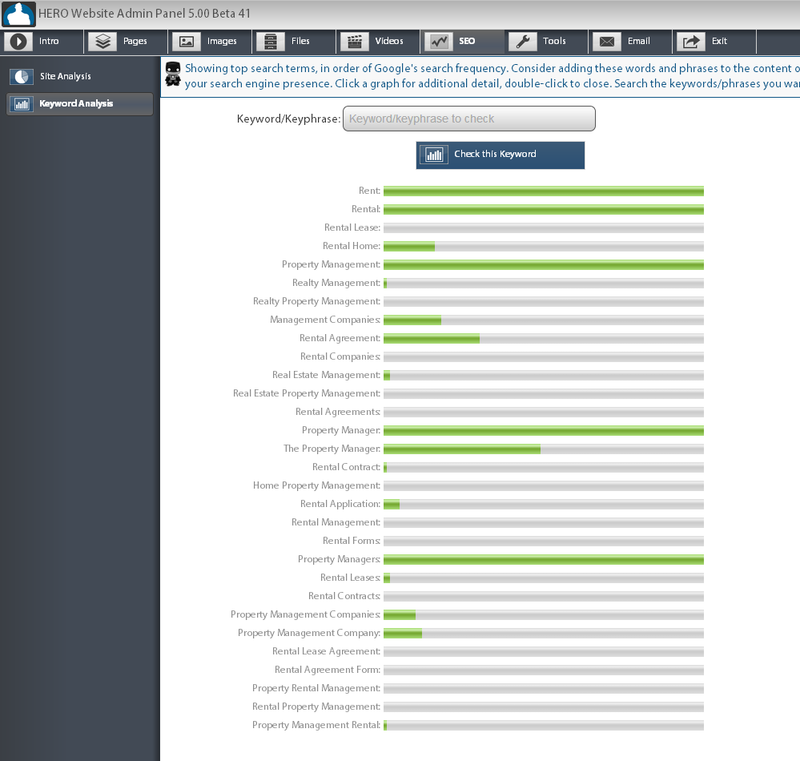 You can see how we anticipate what property managers are looking for and deliver it in a super-simple, easy-to-use way. This comes from the experience of building more property management websites than any other company. Email is built right into your HERO Website account. You can control the settings of your email, like forwarding, aliases, auto-responders, temporary storage allocation, and more right from your website admin panel. Email can work on all of the domains that you have associated with your HERO Website account. If you prefer another email solution, we have ready-to-go integrations with Google, Microsoft, or your own email server. Domain name management is built into your HERO Website. You can register domains with HERO as the sponsoring registrar, and the first two are included in your package cost. You can have email service on all domains you register with HERO. Each domain can point to a different page on your website, or to a different site in your website account. Once you register a domain, we'll lock it and auto-renew it, so you never have to worry about it again. HERO Websites are all designed so that they'll work well on a mobile device, unless you specifically request features that are not mobile compatible. However, you can also create (or have us help you) a mobile website that is designed specifically for small format screens and is fast loading and easy to navigate. This website can contain content from your main website, or can simply contain the information that your mobile users find most important, like an overview of your company, summary of your available listings, and contact information/map to your office. This is pure HERO Websites magic! Your website account supports an unlimited number of websites. While most property managers are served well with a single site (or a standard and a mobile site) many property management companies have separate enterprises associated with their company. There is no need to go out and get a separate website provider for each of these. A single website account can give you a site for property management, another for sales, another for association management, and another for your maintenance company. 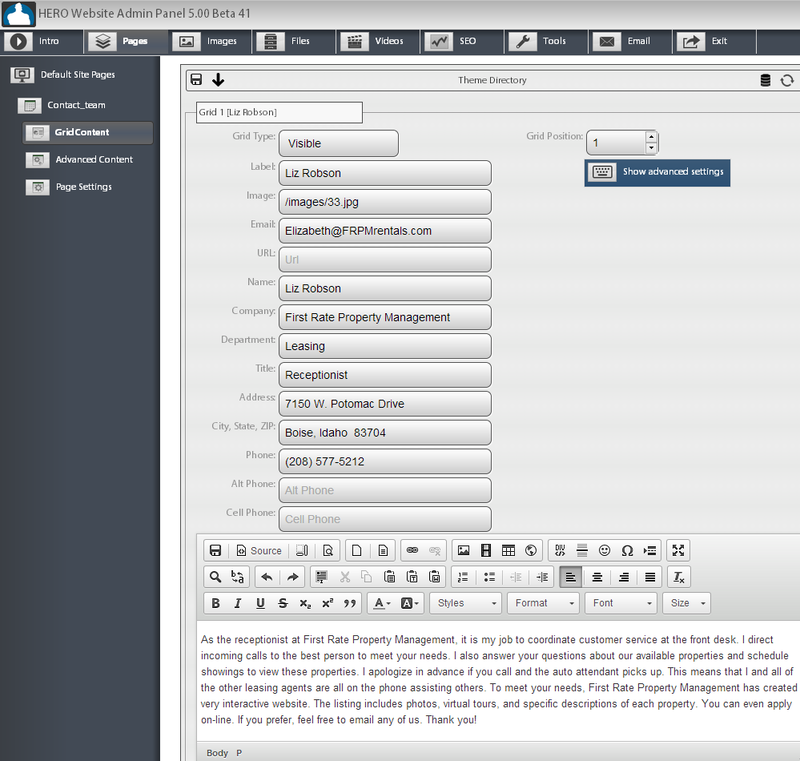 Your HERO Website includes a Grid page type, which you can set up using the sales listing or commercial listing style. This is a great way to summarize your available listings. Each listing will appear in the listings page and will have its own dedicated page as well. The sales and commercial listing formats supports both list and panel layouts to match the style of your site. This is no replacement for a full sales or commercial listing platform, if that's a significant part of your business. In that case, you should, at a minimum, use your MLS and/or commercial listings platform like Loopnet. When you use a platform like this, your listings can generally be embedded in your HERO Website even when they're managed through an external service. Your HERO Website includes a Grid page type, which you can set up using the directory style. This is a great way to give each team member a full online profile, which shows up in your staff directory and gives each team member a full profile page as well. The directory format supports both list and panel layouts to match the style of your site. With the Platinum package, this is all built in to your HERO Website. 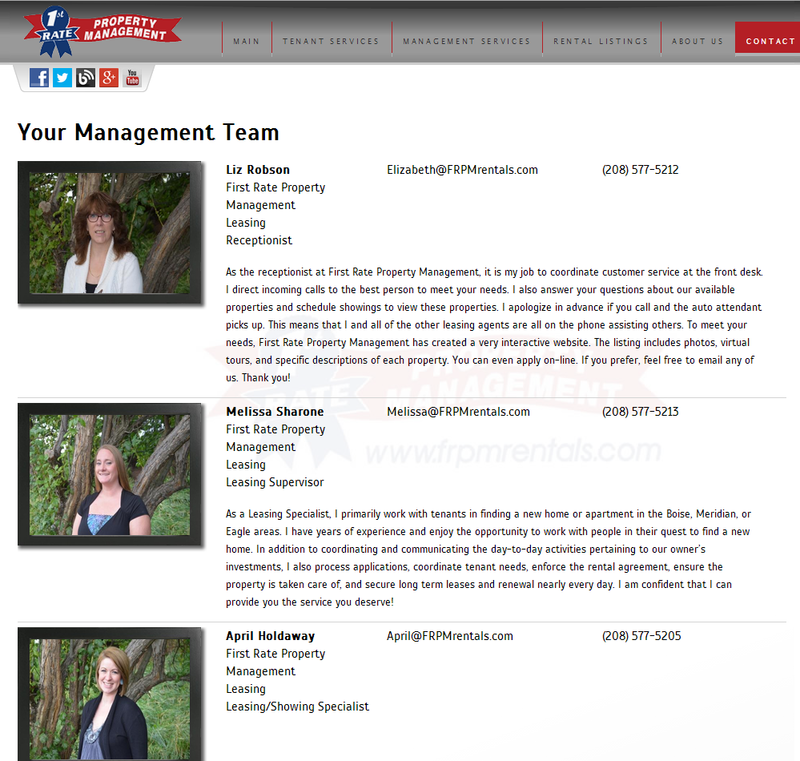 You have access to everything you need to be a full-service online property management company. If you use another service for portals, or applications, or rent payments, you can simply add these into your HERO Website. Your website is fully compatible with any web-based solution including Appfolio, Buildium, Yardi, PropertyWare, RentManager, and more. HERO Websites provides full video integration with YouTube. Simply add a video to your site's Videos library, then include it anywhere, on any page, in any size you desire. The include method also gains you the advantages of YouTube video SEO. 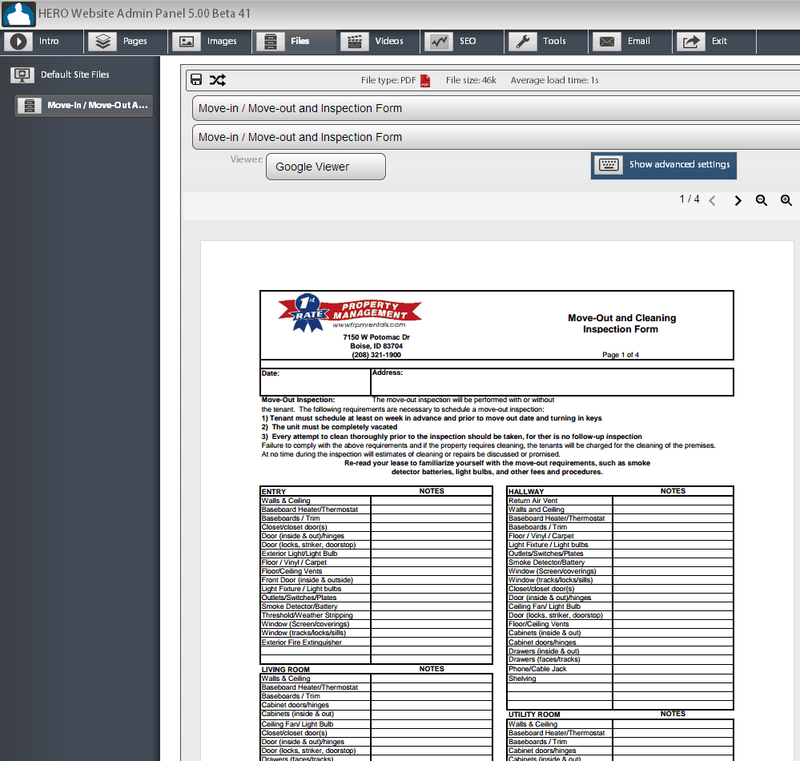 HERO Websites provides full, easy-to-use support for downloadable and viewable forms and files. Simply add the file to your site's Files library, and it will be available to include in any page on your site, anywhere. You can set your files to open inside your website as a viewable form/file, or you can select to have it downloaded to the user. 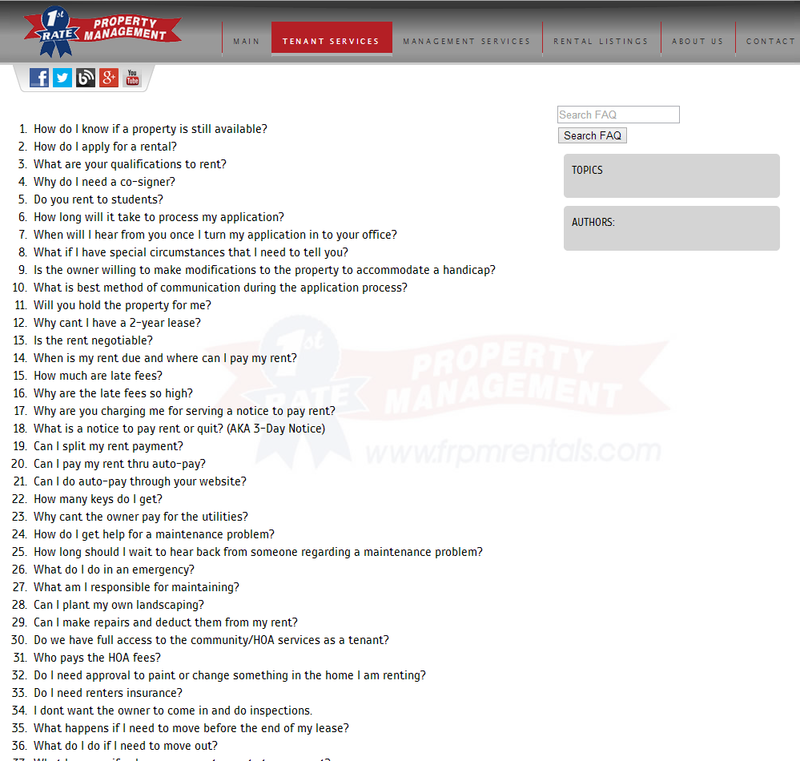 Lists of frequently asked questions are a cornerstone of a good property management website, and HERO Websites includes an awesome tool for creating and managing FAQs. You can theme your FAQ with five fully customizable themes, group questions into logical blocks, change the order of questions, add images, files, and videos, allow usefulness voting, organize by tags and topics, and so much more. Menus are how a user finds what they need in your website, and a good menu is essential both visually and functionally. HERO Websites includes over 650 pre-defined menus, each of which is fully customizable. The system automatically adds new pages to your menu, if desired, to ensure that your pages are easy to access from everywhere. The HERO Website system includes pre-defined WebGadgets for commonly used social media, like a Facebook like box and Twitter profile feed. Simply point and click to add these to your site. The system also includes approved social media icons for inclusion anywhere in your site. Your integrated listings also include social media share icons to post listing to common social media platforms. HERO PM has your social media covered! Your HERO Website package (both Gold and Platinum) includes the full-featured HERO Listings system, with direct integration to your website. The HERO Listings system is simply the best solution for marketing available listings, including exports to the largest number of rental sites anywhere. The included website integration gives you all the features directly in your own website. The system is also designed with WebGadget functionality in mind; you can add a website display of your featured listings, or a listings slideshow, or just about anything else you can imagine! HERO Websites offer a Secure Website upgrade if you wish to add SSL/HTTPS to your primary domain. The upgrade includes a secure certificate for your company, and the required configuration for the lock icon to appear in the address bar. 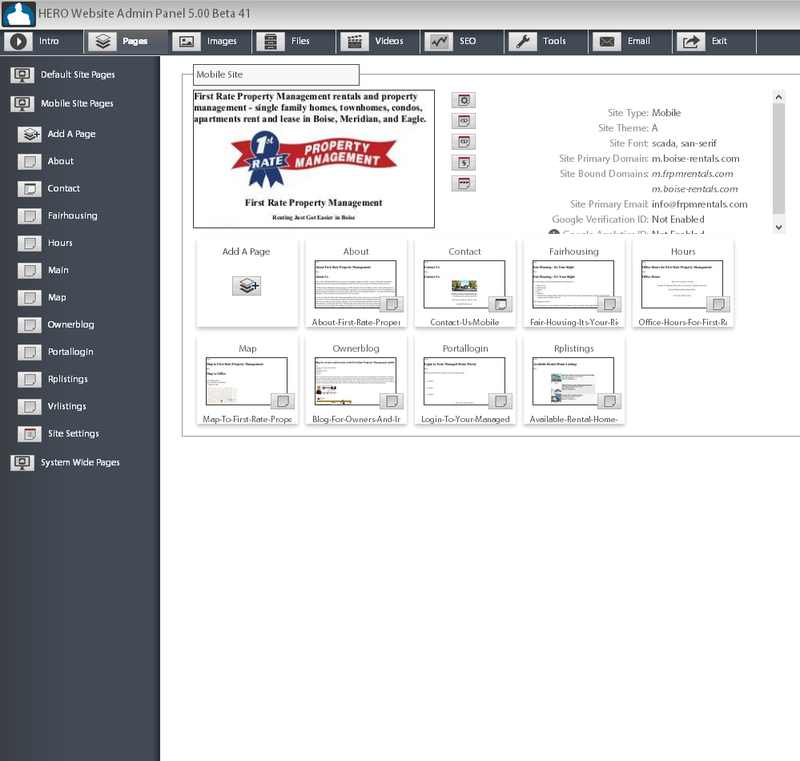 Website Manager: Point and click access to add pages, images, files, videos, and content throughout the site. Website Editor: Full control over HTML and CSS using assistive graphical interfaces. Website Developer: Direct raw editing of codes, scripts, styles, and more. A user with sufficient access can work at any level at any time. Switching from graphical to raw editing controls is as simple as clicking a button. HERO PM hates pricing games. We make pricing simple, easy to understand, and very affordable. 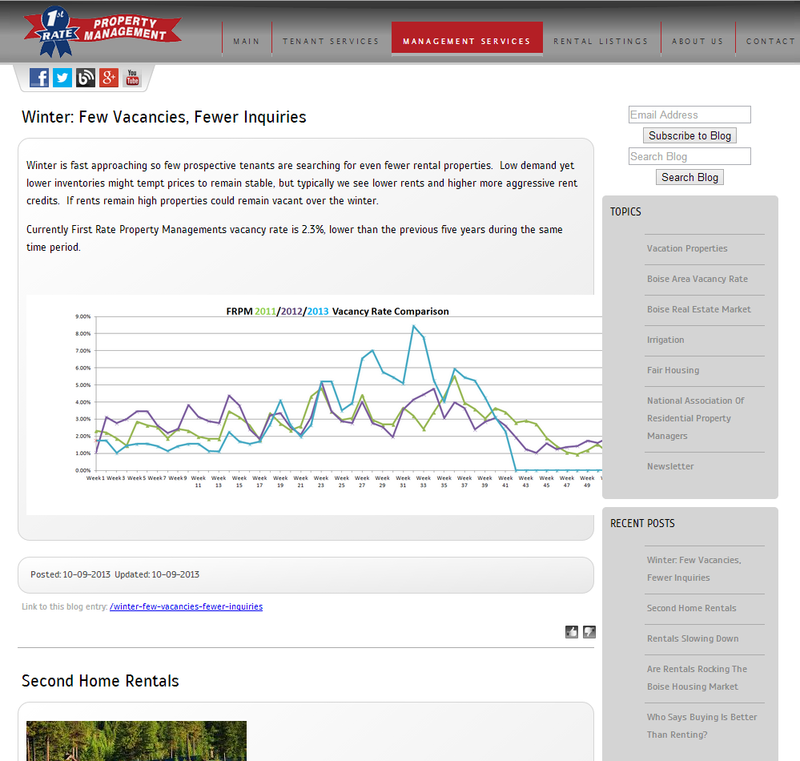 All website packages include both the HERO Listings system and the HERO Website system. 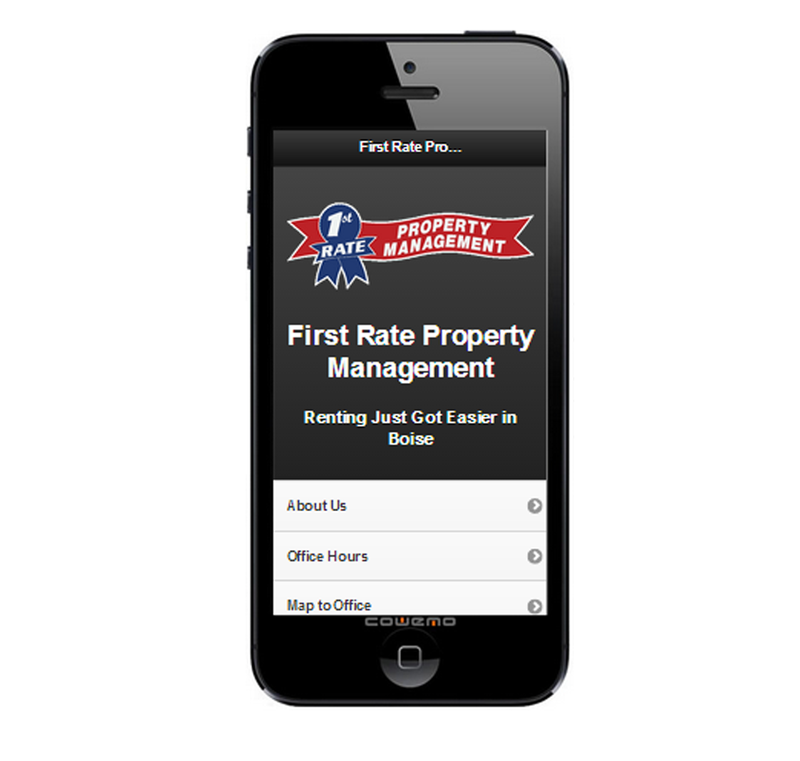 It's not just a website, it's a full marketing system for residential property managers. The Gold package includes HERO Listings and HERO Websites for a monthly fee of $109 and a one-time setup of $249. 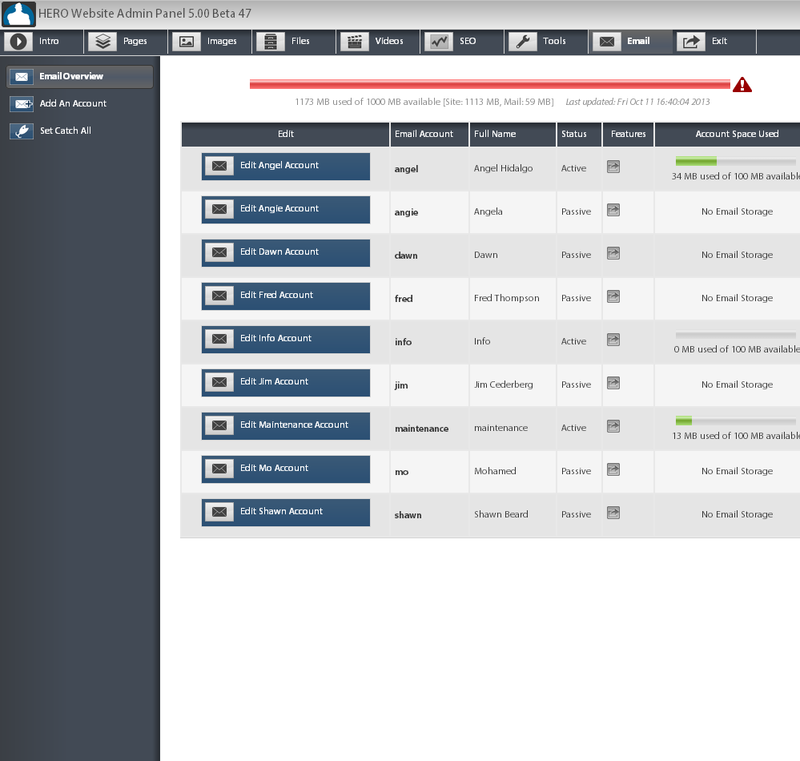 The Platinum package adds HERO Management, with features like applications, rent payments, portals, document management, workorder management, and more. The fee for this is $149 per month with a one-time setup of $499. There is no per-unit cost associated with any HERO package. If you wish to add individually managed portfolios, the cost is $20 per month for an agent/manager. The website design fees are $0, $395, $695, $1395, or $2395. $0 provides a Rapid Start setup based on one of the available templates created specifically for property management. See the current Rapid Start styles by selecting the menu item up top. $395 provides a Conversion setup where we take the design created by your local designer and convert it into the full-featured HERO Website system. $695 provides a Quick Custom setup where you choose a design from a catalog, or we create a recommended design for you. 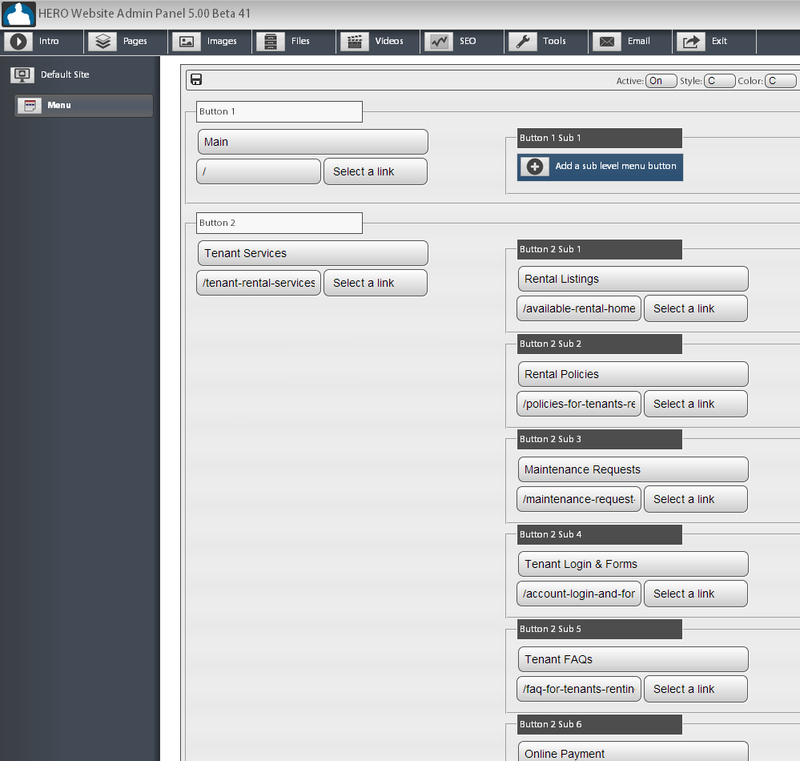 See the current design catalog from your Control Panel. Once a design is purchased, it is exclusive to you and cannot be used by anyone else, as the templates can. $1395 provides a Professional Custom setup, where we assign a consultant to help you determine what you need in your website, based on your unique market, specializations, and existing marketing. $2395 provides an Ultimate Custom setup, which includes the Professional Custom and gives you three different designs and you can choose the one that thrills you most, adds a professionally redesigned logo, and includes social media integration. To add the Secure Website upgrade, providing a secure certificate and secure configuration and giving you the trusted lock icon and corresponding SEO improvement, the cost is $100 initially and $50 in subsequent years for certificate renewal. When you want to make changes to your website, that's completely free. You can make all the changes you want to the design, layout, and content of your site. You can add additional websites to your account. You can create a mobile site. You have full control of your website, and we'll support you all the way. If you'd rather just have us do the work for you, we have a team of Personal Webmasters who will do your project for you at the reduced member rate of $49 per hour. Everything else is included in the package. Full email service, two domains, listings marketing, all the features described in this FAQ, and more.